well, hello again, blog! i’m happy to report that things are back to “normal” at the shoebox. it was hacked a month or so ago, and we’ve been working on moving content around and finding a suitable server. (hello, godaddy!) the shoebox is back with one more nashville recipe. then, we get to move onto the wa ones! the cookies are soft and chewy and are a bunch of wonderful cookie types, all rolled into one tasty gem. i’m thinking next time, i’ll throw some pretzels in there, too! i love the sweet/salty combination. pre-heat oven to 350°. use either non-stick air-bake sheets (like i have and love) or line two cookie sheets with parchment paper. 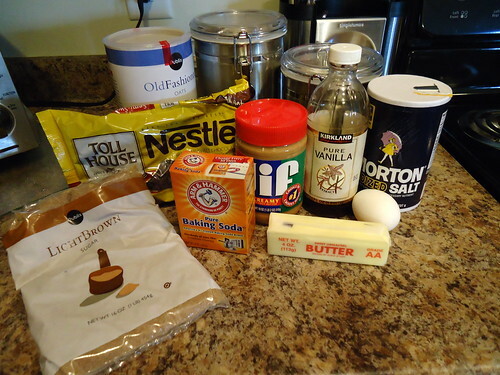 in a stand mixer, fitted with the paddle attachment, cream together butter, pb, sugars and vanilla extract. gradually add the flour mixture until just combined. stir in the oats and then the chocolate chips. 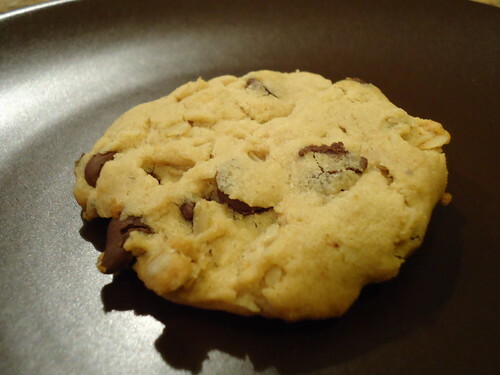 the original recipe calls for larger cookies (3 tbsp/cookie). to stretch the recipe, i made 2 tbsp drop cookies. bake the cookies for 10 min, or until the cookies are golden brown. cool on a cooling rack and store in an airtight conditioner.